The Teensy, Tiny, Insignificant Details: Christmas In July. Sort Of! CHRISTMAS SPICE BISCUITS - Margaret Fulton's "Baking"
Sift everything as far as the sugars into a large bowl. Add butter and rub in until resembles breadcrumbs (or be lazy like me and dump the whole lot in a food processor to do most of the work then finish it off by hand). Combine milk and bicarb in a cup and stir into flour mixture (I used a butter knife to get it started). Knead lightly to form a firm but elastic dough (I kept going until it stuck together properly and could roll a ball with it. Wouldn't say it was an especially light knead but it came out okay). Halve dough, wrap in Glad wrap and refrigerate 30mins. Roll out dough (leave other bit in fridge) to about 4mm and cut with cutters of choice. Re-knead dough scraps and re chill before rolling out again. Bake 15-20mins or until golden. Keep an eye on them as they will catch quickly. You may need to rotate pans. 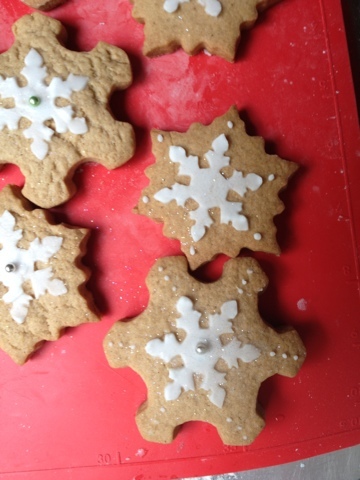 Decorate as desired (recipe suggests a dusting of icing sugar. Thanks Erica :) I LOVE DISCO DUST!!! It looks great on cup cakes as well. It's not cheap but a little bit goes a long way. Apply it with a soft-bristled brush - dip it in, then get your finger (or a skewer) and rub the brush against it so you're sprinkling over the top of the baked goods. 1. White pepper looks like cigarette ash, so cooking with it always gives me the wiggens. 2. It's the cook's prerogative to eat all the little straggly bits!! There are two reasons I cook. One, to see that "mmm" look on people's faces, and two, to eat the bits I want. Must say I'm curious as to the difference in taste between black and white pepper... and yet, not curious enough to Google it! Thanks Kristina :) Christmas in July is a really obvious conclusion for Australians (but I haven't technically attended one), and yet we insist on cooking a roast on Christmas day in the height of summer! I don't think there is a flavour difference between white and black pepper - but there is a visual difference, so when you don't want black specks through your food white pepper is often suggested. I've always wanted a proper white Christmas, and the closest I came was Christmas in the UK a few years back. Unfortunately in snowed the month before, but Christmas day was just cold and overcast and miserable. On the plus side, a pair of squirrels were playing on the lawn which was pretty cool for me to see! Oh Christmas makes me SO happy :) even if its in July ;) I love the decorations! Fab! Love these!! They sound so yummy! And what a nice little holiday treat! I especially love your icing design! I am going to have to try this recipe! ...soon too- because now I am craving cookies!! !